An abomination of a treadmill, fraught with dangerous design elements. While extremely cheap nothing can make the price worth the design flaws and safety risk. And if you wind up returning this treadmill it will likely cost you more to freight back than you paid for the unit in the first place. Lifetime on frame, three years on motor, electronics and other parts. Readouts are at the head of the treadmill, hidden user view by their desk. Speed is set by your own walking pace, making it nearly impossible to work at a keyboard. Cheap. At least cheap to buy. Very expensive to return. Severely underpowered and undersized, this treadmill would be dangerous for the average American to use. With a whimpy 0.74 HP motor and tiny walking belt, the Versadesk office treadmill has a user weight rating of only 200 lbs. You cannot even see the display readout while walking because the display is at the head of the treadmill, hidden by your desk. Speed control is guided by your own walking pace, both requiring concentration and making it virtually impossible to maintain a consistent distance between you and your keyboard. Typing is completely impractical and fraught with potential for injury. Run, do not walk away from this treadmill. A cheap Chinese-made knock off of an office treadmill, this unit is unsafe and patently unusable for any normal sized individual who wants to work while walking. Do not be fooled by the cheap price, when it comes to treadmills you really do get what you pay for, and in this case much less than you thought you were bargaining for. 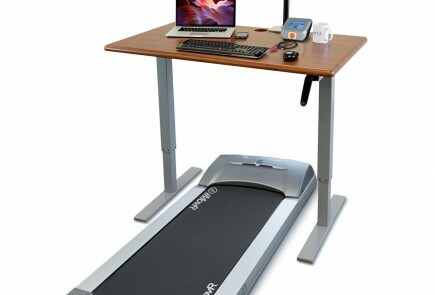 Desktop converter manufacturer Versadesk is branching out into other product categories in office fitness. So far, the offerings appear to be more ultra-cheap Chinese knock-offs, including full sit-to-stand desks, an upright desk cycle, a balance board and a standing mat, along with more models of standing desk converters. They seem to be following the same failed business strategy that sunk InMovement, but like the LifeFitness spin-off the people behind the Versadesk brand seem to have very little actual knowledge of office fitness science or ergonomics. Most recently they’ve added an “Ultra-Thin Office Treadmill Base,” which is what we’re going to review here. If you’re considering this purchase you’ll find a lot more specifics about this product here in our review than you’ll ever find on the company’s marketing website. We had to play 20 Questions with an online rep with through live chat several times to get very basic information that you’d normally expect to be in published marketing materials for any treadmill product. Worse, the online rep couldn’t answer basic questions or provide details that any discriminating buyer would want to know before plunking down their cash. Our review staff experts have lab tested every treadmill desk that’s been introduced since the progenitor of the category, the Steelcase Walkstation, circa 2007. As J.K. Simmons says in those Farmers Insurance commercials, “We know a thing or two because we’ve seen a thing or two” when it comes to treadmill designs. And we’ve seen some really cheap treadmill bases before like the now-defunct TreadDesk and the Exerpeutic Workfit 2000. But we’ve never seen anything this cheap and toy-like before. Not that we expected much for the $479 price. Let’s start with the motor, which we knew couldn’t be very powerful given the thinness of the Versadesk treadmill. Not only can you not pack a powerful motor into such a small profile, you certainly can’t fit a flywheel in there, so you can expect a pretty horrific hesitation every time you heel strikes the deck. Indeed, the motor turns out to be a whimpy 0.74 HP (which they advertise as a terrific-sounding “550 Watts”), in a product where you really want a minimum of 2.25 HP like you’ll find in the Lifespan TR1200-DT3, and ideally 3 HP like you’ll find in the state-of-the-art iMovR ThermoTread GT Office Treadmill. Not surprisingly, this treadmill thus has a user weight limit of 200 lbs., where one truly designed for people, not dogs, would have a user weight limit of 350-400 lbs. Learn more about treadmill power ratings in our Primer on Treadmill Powertrains. We consider 18″ to be the bare minimum width and 48″ to be the bare minimum length of a treadmill’s walking belt for safety. Better are belts that are at least 20″ wide and 50″ long. Versadesk miniaturized their belt to 14.4″ x 40″, which is not just practically unusable by any normal-sized person, it’s exceedingly dangerous. In testing the now-defunct Woodway treadmill desk several years ago, which also had a 40″-long belt, every test subject jumped off it abject fear for their lives within thirty seconds, the first time they felt the rear roller under their feet. Again, this may be a perfectly good treadmill for a medium-sized dog, but was not designed for human safety. See our primer on Does Treadmill Belt Width on a Walking Desk Make Any Difference? 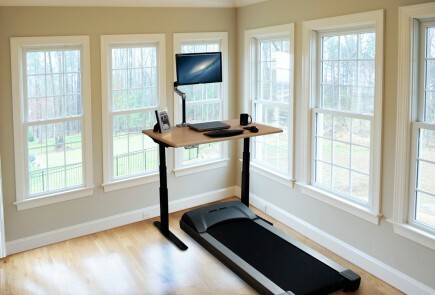 The Versadesk office treadmill is 6″ high, so in that regard the deck is roughly the same height as just about every other standalone walking treadmill base out there. Where thinness comes in is at the motor housing, where most treadmills have a bump to accommodate the all-important flywheel. Without a flywheel, and especially with an under-powered motor, a treadmill cannot maintain a consistent speed as your feet contact and lift off the walking belt. As for its other dimensions, the treadmill’s footprint is 24″ wide and 59″ long. That’s great in terms of taking up little space on your office floor, but as we said above, dangerously small for an average sized American user. We would be very concerned about accidental tripping and falling, and certainly would not recommend it for any kind of corporate, government or educational campus setting. Speed Control? Why Would You Need That? 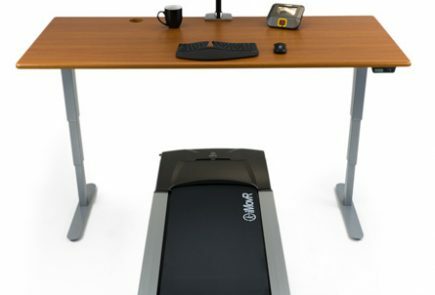 This is where we really feel Versadesk has crossed the line to advertising fraud in calling this an office treadmill. The way you control the treadmill’s speed is by stepping on the first third of the belt to speed up, the back third to slow down and the middle third to maintain a constant speed. They call this “Intelligent Speed Control.” In all practicality this does not work while trying to type at a keyboard. It’s fine if all you’re doing is walking in the middle of your living room while watching TV, but if you try typing at desk while walking you’ll be frustrated to death in minutes. Theoretically you could use the remote control to awkwardly set a specific speed (crouching under your desk to see the resultant speed from pushing the buttons on the remote) however no one we could reach at the company could actually verify that they had ever done this themselves. They had never even seen the remote. So until we get a unit here to lab test we can’t verify that you can actually set a specific walking speed on this treadmill. In fact we’re highly skeptical that this treadmill was every UL-certified, despite the online rep claiming that it was. According to published standards for mechanized treadmills safety handlebars are a requirement, unless a waiver is obtained. The waiver, specifically for treadmill desks, requires the unit to be placarded to only be used with a desk, and the treadmill itself cannot reach running speeds. We have requested documentation of their claimed UL certification, which we have not yet received, and frankly don’t expect to. Learn more about what employers typically require before you can bring a treadmill desk into your office in our primer on What Legal Departments Need to Know About Treadmill Desks. With a top speed of 6 kilometers per hour (3.73 mph), this treadmill falls out of the recommended range for treadmill desk walking of 2.5 mph. Learn more about the differences between cardio treadmills and true office treadmills. Particularly given the acrobatics required to set the treadmills walking speed we add this to our list of safety concerns, on top of the fact that typing productivity will be nil at such exercise speeds. In numerous places, like this warranty page, Versadesk claims that “all” their products are designed and assembled in the USA. This is patently false. This treadmill, like some of their other cheap-o products is made in China, and Versadesk only distributes it in the US under its own brand. The advertised Lifetime Warranty is only on the frame, the least likely part to ever fail. As for motor, electronics and other moving parts, the warranty is limited to three years. The only sort-of good news here is that the company does offer a 30-day money-back guarantee. And you’ll likely know within 30 minutes if you want to keep the treadmill (we’re assuming you’re of very small stature), or cough up as much money to ship it back as you’ll get back in your refund, if not more. Despite all the componentry shortcomings this treadmill weighs a whopping 150 lbs, the same as a true office treadmill like a Thermotread GT. Apparently they’re not fans of aluminum, which ways one third as much as steel but costs a lot more. And so all that means that this treadmill will be shipped to you by freight and you’d need to ship it back by freight, easily costing several hundreds of dollars. This, too, is omitted from the marketing copy on the Versadesk website. The Versadesk Ultra-Thin Treadmill is the new bottom-of-the-pile choice in office treadmills, from a company with highly questionable marketing practices we really think the FTC should look into. While you may be tempted by the ultra-cheap price you’ll be ultra-sorry to learn what it costs to ship the unit back for a refund if you don’t like it. And we’d be very surprised if anyone found this ridiculous and dangerous design to their liking. Incidentally, Versadesk is not the only company selling this exact same model in the US. 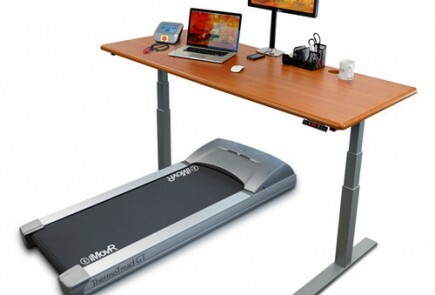 Others are sourcing it from the same Chinese factory and marketing it as a treadmill desk base, including Xspec. Serenelife, IPO and Goplus sell a version of this treadmill with a fold-up handlebar (52″ high). Each of these marketers has the same specs for treadmill size and motor rating but wildly varying product weight specs, from 46 lbs to 63 lbs to 78 lbs, all the way up to 150 lbs as claimed by Versadesk. Max user weight ratings (infamously manipulated by treadmill manufacturers’ marketing departments) vary from 200 to 220 to 265 lbs. Pricing on Amazon varies from $399 to $679 to $899, all for the same unit. There’s even a pink version from G Electric that sells for over $1,800! User comments for these various sellers on Amazon can be summed up as a bunch of obviously planted 5-star reviews with professional videos and feature lists created by Chinese marketing departments to customers complaining that they bought for their dogs but the dogs couldn’t figure out how to set the speed on the treadmill using the goofy “Intelligent Speed Control” so they returned the unit! We guess this buzz phrase actually means you must have greater intelligence than a dog to figure out how to set the speed of the treadmill. Check out all our in-depth coverage in our round-up of Top Treadmill Desk Reviews. Learn about how we research treadmill desk products in Anatomy of a Review. We hope you do find an appropriate model for your needs, and when you do be sure to read up on everything you’ll want to know about treadmill desking in our experts’ guide to What to Expect When You’re Expecting Your First Treadmill Desk.